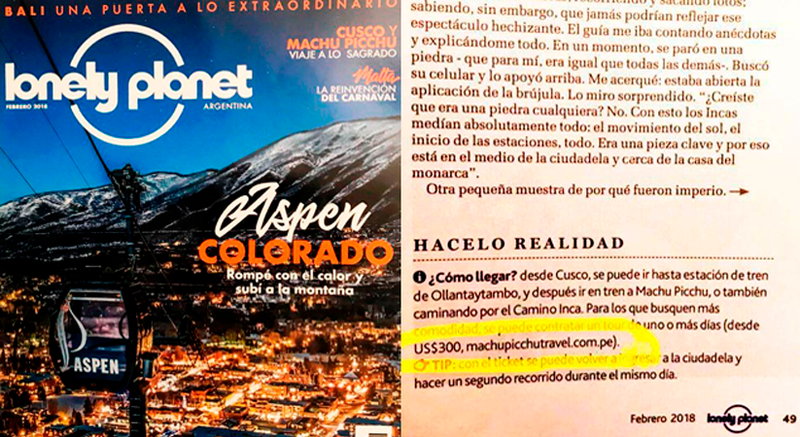 The magazine Lonely Planet recommends the travel agency "Machupicchu Travel" to make your trip to Cusco and Machu Picchu. The most important magazine of the world tourism, in its edition of the month of February, made a report of Cusco and Machu Picchu that I call "Peru of fantastic monuments and sacred valleys". In the report it shows the awesomeness of Cusco and Machupicchu, incredible images, but also indicates that it is not only Cusco and Machu Picchu, but there are other spectacular and amazing places to visit in Cusco such as the Sacred Valleys, the Sacred Valley of the Incas (the salineras de Maras), Chinchero or the South Valley (Andean Baroque route) and the mountain of seven colors (Vinicunca). At the end of the report, the magazine recommends to its millions of readers that when visiting Peru, take the option of Machu Picchu Travel ", it is even more, until it shows our web page, which we consider as a great recognition, award to the work that we do for attend with the best quality to our tourists. Lonely Planet is one of the largest publishers of travel guides in the world. It was the first popular series of travel books aimed at backpackers and budget travelers. Machupicchu Travel organizes the best of your trips to all of Peru, do not wait any longer and contact us, a sales agent will be waiting for you to start the live chat, we attend 24 hours a day, 360 days a year, reserve now!.